It’s been almost 2 1/2 months since I began meditating regularly. Time spent oh so wisely! In my last update, I outlined some of the effects I felt after just 3 weeks of meditation. I’m happy to report that things have continued to improve for me, and I can’t imagine my life without this daily practice. Visualization. I’ve been using the power of visualization, chakras are really useful here, to manifest all kinds of gloriousness in my life. All I can say is that this has steered my life in a really positive direction. I see dreams taking shape, and I have had an abundance of motivation to put in the work necessary to merge my dreams with reality. Mantras. I usually choose a different mantra for each day, but sometimes I feel the need to stick with one for many days. As you might have guessed, my mantras and my visualizations are inextricably linked. Headphones. Even when I’m all alone and it’s perfectly quiet in my house, I have really loved wearing headphones for my meditations. It’s like the music or guided meditations are a part of me, and I have much more rejuvenative sessions. When I listen to vibrational healing sounds, using headphones is next level. Feeling the vibrations from head to toe is an amazing sensation! Eye pillow. 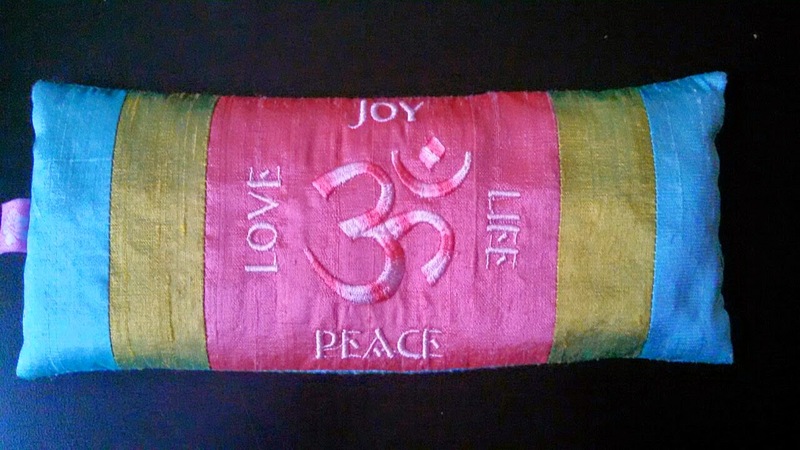 My best friend sent me a beautiful eye pillow that I love to use when I’m very tired and decide to meditate while lying down. I also love to use it for pre-sleep meditations. It has the Om symbol (how appropriate that it sits on the third eye!) surrounded by beautiful words, and it is filled with organic flax and “a generous amount of lavender”. It’s been a miraculous 75 days, and I’m so grateful for this experience as it continues to unfold!